10,158 miles. Incredible thunderstorms, raging forest fires, dense smoke, hail, sleet, cops, a half-a-dozen paramedics, bears, and even a dragon or two…you know…the usual stuff. 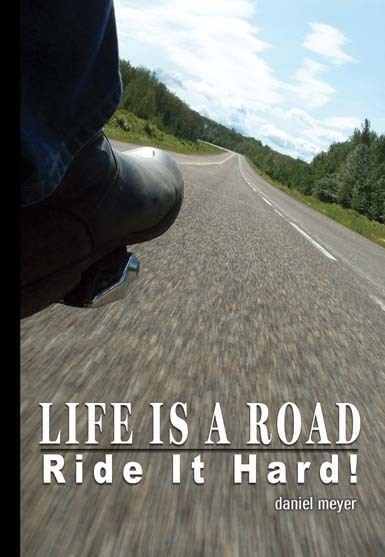 Life Is a Road, Ride It Hard, joins Daniel’s other Life Is a Road books in earning both the iUniverse’s “Editor’s Choice” and “Reader’s Choice” Awards. …turns macho expectations upside down. Meyer is a masterful narrator. The author communicates with his audience superbly. At a time when some sociologists claim that our frontiers are behind us, Meyer finds adventure and meaning in that most American of locales: on the road. Meyer is a genuine biker, and he feels no insecure need to fit the standard clichés. Meyer is an experienced writer, and he has carefully and thoroughly worked with his structure and organization in order to serve his narrative as strongly as possible. Most fascinating…are his comments on human nature and the universal truths of life. One of the strengths of the manuscript is the author’s powerful narrative. He can also be remarkably reflective at times—as well as outrageously funny. Meyer is a wonderful narrator, and this book is easy to read, informative, perceptive, and fun.